We are excited to showcase a custom project we recently completed. The pocket folder is unique from its stock to final conversion: featuring custom paper, custom die cut, business card slits, two capacity spines, one pocket, and silver foil stamping. While we are excited about all of our custom projects, we are especially pleased with this project because it encompasses so many different custom options. Moreover, we have been emphasizing our digital press capabilities of raised foil and raised uv quite often, and this gorgeous custom project turns away from that. Instead, it highlights traditional print exceptionally well. From start to finish, this project has been an excited challenge that truly demonstrates the power of customization when it comes to promotional marketing materials. We are proud to show a folder that illustrates an anatomy that can be modified to your client’s needs. Paper: This folder was printed on 18 pt Neenah Folding Board Paper. This paper has a Vellum finish and is labeled as Desert Storm for the sandy color. The paper is cut non-traditionally as well with a triangular front cover. Printing: The custom presentation folder features one ink color, an aquamarine insignia right above the brand name. The vellum finish of the Neenah stock gives the blue-green a slight shine, while the non-printed parts of the paper remain matte. There is custom die cutting work done on the back panel as well as on the inside panel business card slits. The custom die cut slit closer which allows the front panel to close on the cover of the folder. Additionally, the custom business card slits are horizontal on the center panel. 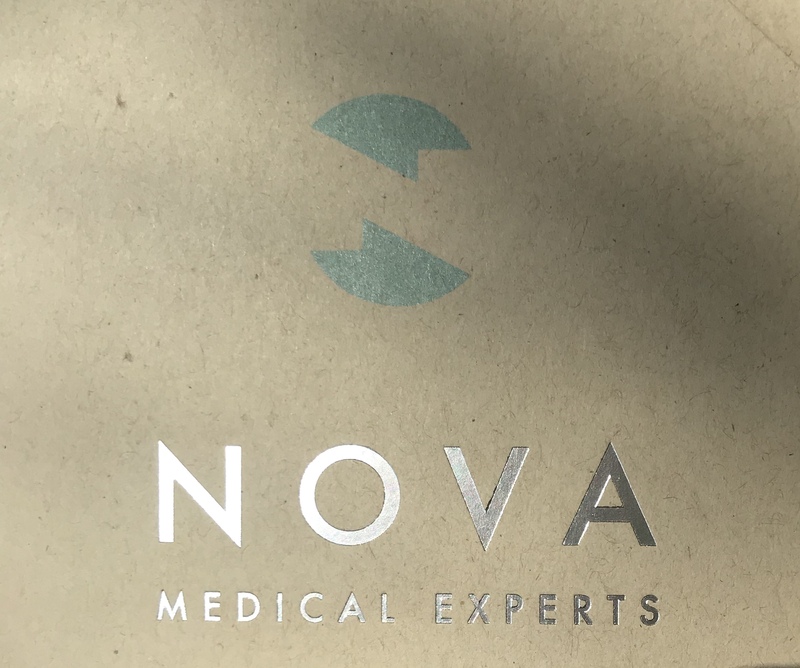 The custom presentation folder project features a silver foil stamped corporation name on the front cover, right underneath the ink printed logo. This is an excellent usage of silver foil stamping, as it contributes to the minimal and clean feel to the sans serif, all capitalized font. The silver foil stamp also contrasts with the matte vellum finish of the stock, allowing the corporate name to stand out. Two capacity spines are incorporated into this project, one on either panel, allowing the middle pocket to stand taller and hold much more paper than a traditional presentation folder without a capacity spine. Capacity spines are a great addition to presentation folders that are meant to hold lengthy reports or paperwork, and are commonly used in a variety of professional fields including: medical, accounting, and real estate. 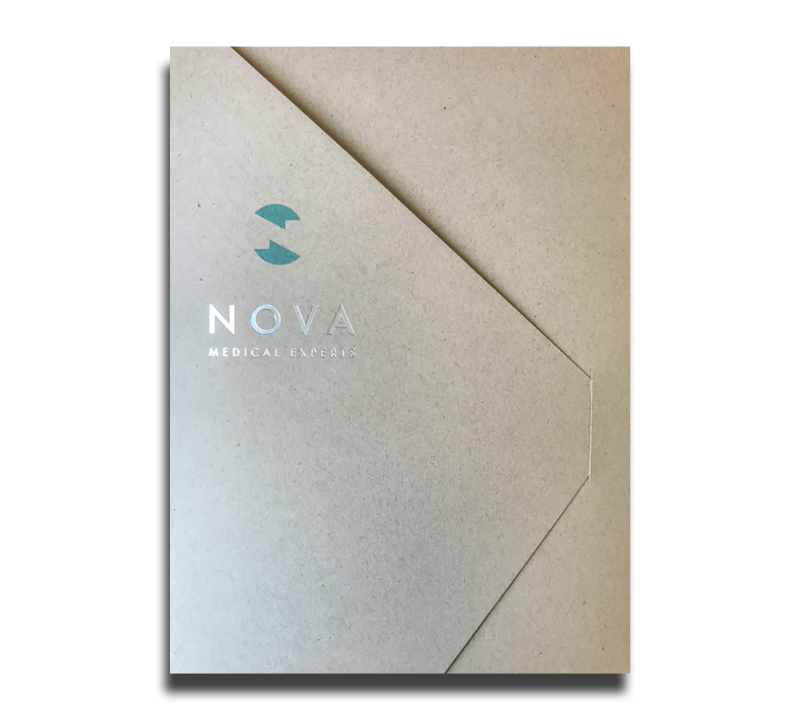 Tri-panel folders are a common request for presentation folders, as they can hold more information and have a brochure-like quality. We commonly run custom tri-panel folder projects, however, this one stood out to us because of its unique design and functionality of each panel. 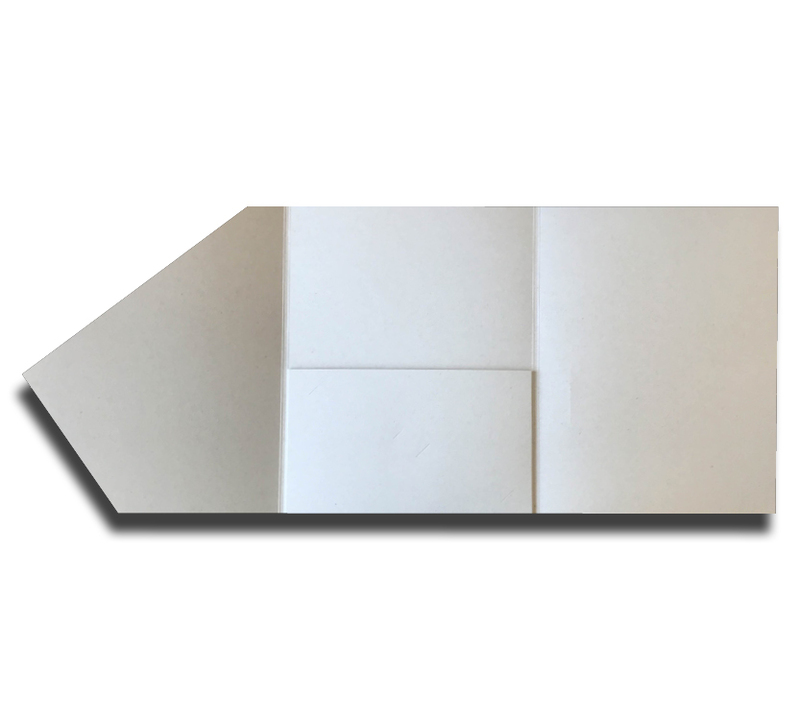 The first and last panel link together around the middle panel to form a closed folder, almost like an envelope or package. Overall, this custom project took great design consideration and was well executed. We strongly encourage custom projects like these to introduce to clients not only to make their brands memorable, but also to allow them to fully utilize all the options we are offer so that they can get the best presentation folder for their unique needs. While we are extraordinarily proud of the shape, elegance, and quality of this folder, we are more excited to know that its physical layout enhances its design. If you are interested in learning more about custom projects, feel free to visit our website to request samples or request a custom quote. We would like to get some samples of custom presentation folders. The Nova custom folder is the closest to what we are interested in. Ideally, we are interested in a folder like this but with a matte finished white paper. Can we also get an approximate pricing sheet for something like this? I like how classy it looks. The foil stamping stands out.